How lenient are pet owners when it comes to letting their little buddies sleep on the bed? Anyone who is a dedicated and loving fur parent knows the joys of a wagging tail, or the tranquility of your cat snuggling up to you on the couch. But how lenient are pet owners when it comes to letting their little buddies sleep on the bed? In Australia, 63% of households own a pet, and nearly half of pet owners let their furry friends sleep on the bed. And it’s a similar story in the U.S., with 41% of dogs allowed to sleep in their owner’s bed! Obviously, we’re mad about our pets, but could this be affecting our ability to get restful sleep? When you sleep with a pet, you’re putting a “paws” on good sleep. We all know about the long list of health repercussions due to a lack of sleep, but there’s also a risk of falling ill because of our pets. Fleas, parasites, bacteria or viral infections and roundworm, to just name a few. 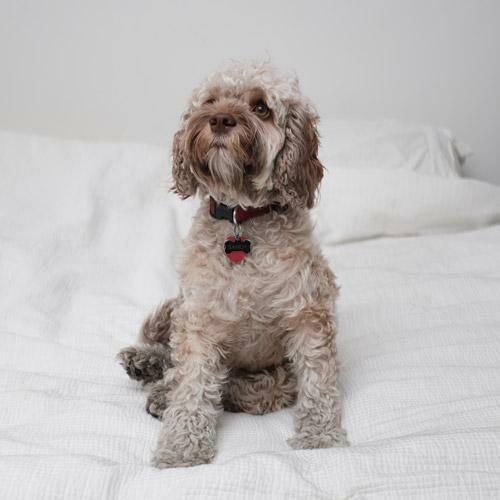 While it is uncommon for humans to catch something from their pets, anyone with allergies or a compromised immune system should consider banning their hairy companions from the bed. Pets are also notorious for disrupting sleep, whether it’s due to their barks and meows, animated dreams of running down cars, or allergic reactions they might trigger. In fact, research suggests 30% of people reported waking up because of their pets at least once a night. And, of those pet owners who shared a bed with their companions more than four nights a week, 63% had poor sleep quality; and 5% said they always or almost always had trouble falling back to sleep after being disturbed by a pet. If you’re reading this and simply cannot fathom your pet deciding to sleep anywhere but by your side, consider these few points. It’s important to take your pet for regular checkups with the vet, keep their vaccinations up to date, and pay attention to their dental health. It’s also unwise to share wet, sloppy kisses with your animal. The harsh reality is, your pet may find you too needy or clingy. You may want to consider some middle ground and allow animals to sleep in their own beds in your bedroom. Perhaps make it a little more inviting with a soft and cozy pet bed nearby, littered with his or her favourite toys. Pets snuggle up to their owners not out of love; they crave your body warmth. Consider adding a heat source to their pet beds. Or, you can put a heating pad under their blankets. Just make sure it doesn’t get too hot. A bit of warmth is enough to help them, and you, have a decent night’s rest.